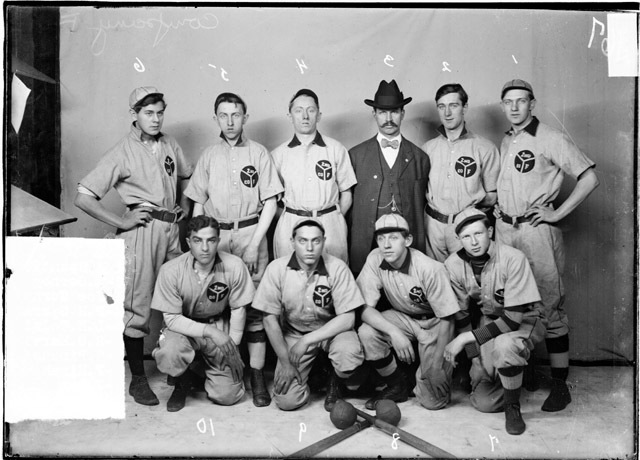 Full-length group portrait of members of the Company F 2nd Regiment indoor baseball team sitting and standing in front of a light-colored backdrop in a room in Chicago, Illinois. Included are: Sam Pincus, Leo. Schultz, Martin Gorney, Frank Hirsh, A. Spanticow. L. H. Tolzien, Joe Gorney, John Bag, and P. H. Garrard. SDN-007522, Chicago Daily News negatives collection, Chicago Historical Society.